Facebook is growing at an incredible rate and can be a great platform to spread the word about your church. Facebook can also be a great way to connect with current church members. Following are 10 tips to help optimize your church Facebook page to grow your church and engage your current church membership. The profile image is one of the main graphics that users will see and associate with your church Facebook page. Your profile image shows up whenever you add a new post or leave a comment. Be sure to have an engaging profile image that may include your church logo, church photo, or an icon that followers will easily identify as your church. The cover image is a great way to make your Facebook page look attractive and appealing to those that visit your page. It is recommended that you change your Facebook cover image several times throughout the year to match the season or to promote an upcoming event or sermon series. Updating your cover image will keep your Facebook page fresh and up-to-date for your visitors. It's not just important to have a nice looking page, but it's also important to keep it up-to-date with fresh relevant content for those that frequent your page. Several content ideas that could be included in your church's social media content calendar could be a Bible verse of the day, inspirational quotes, a question about an upcoming church event, a promotion regarding an upcoming sermon series, or just a general church announcement to help spread the word. Events are a great way to spread the word about an upcoming gathering at your church. In the events tab, you can select the date and time as well as put a description and location of where the event is going to occur. This is a great way to get people to RSVP to an upcoming event. We've all been there, and we know it's important to get that correct headcount to provide donuts for the men's prayer breakfast! Events can be a great way to spread the word and to know how many people will be attending your next church event. It’s not only important to do social media but to actually be social on social media. One of the ways that you can engage or move your Facebook members is to ask questions and to get involved in the dialogue. It is important that you don't just post things for people to see, but that you actually engage them in conversation to keep them coming back for more. If the tracking of website visitors to your church website is one of the goals of your Facebook page, be sure to include Google analytics code to ensure accurate measurement of the visitors to your church website. One of the ways that you can do this is by easily adding a UTM Source to the end of each link you post on your Facebook page. Following is a quick example how you can easily add that UTM source, and how you can track this information inside of Google analytics. When setting up your church Facebook page, be sure to write a compelling description about your church. This isn't meant to be super salesy, but it is meant to get the correct view of your church. An example could be your mission statement, and having a good feeling of what a visitor good experience when I come to your Church for the first time. It is very important that the information that you post to your church Facebook page is relevant, encouraging, and engaging and includes content that your viewers truly want to see. The success of your Facebook page will be determined by the frequency and relevancy of the content that you share to those that like your page. This may seem so simple, but it is one area that many churches forget to do. They forget to link to their church's Facebook page from their church's website or other marketing materials. 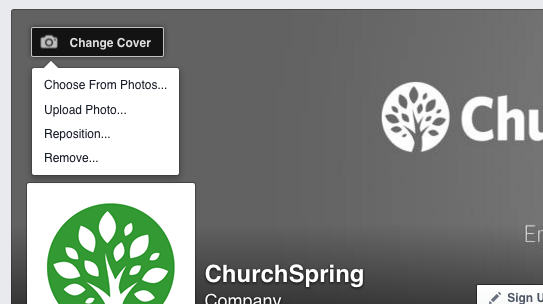 Be sure to put the Facebook icon on your church's website and add a link to your church Facebook page. This way users can easily connect with you and learn more about your church and how they can get involved. This is one of the fundamental areas that we teach our children as they grow up. It's important to share, and this is so true when it comes to social media and specifically Facebook. When you post important content, it could be as simple as an upcoming sermon series, or an event that you're trying to spread the word. Ask your church membership to share that content on their Facebook page. A simple email asking them to share will go a long way in helping spread the word about your upcoming sermon series event or just getting the word out about your church. It is important that you establish a voice and tone for your Facebook page. A voice and tone could be as simple as saying "we want to be fun and casual" on our Facebook page. It could also be "we want to be fun, but professional." A lot of your voice and tone should be a true reflection of your church. Your Facebook page can be a powerful way to spread the word about your church. It's important that you approach your Facebook page with a plan to make sure that it is effective and is as optimized as it can possibly be. How are you using your Facebook page to spread the word? 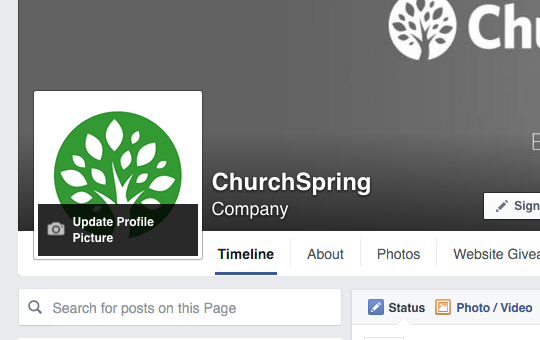 Visit us online at churchspring.com/facebook and share your ideas of how you're utilizing Facebook to spread the word about your church. Want to learn how to save 20 hours per week using the tools the pro’s use to manage the social media accounts of the top ministries in America? Download Now.